The north of Spain is filled with apple orchards that provide some of the country's best apples for hard apple ciders and apple desserts. One of our favorite Spanish apple recipes for fall are these creamy and delicious Spanish apple tarts. These individually sized Spanish apple tarts have a light, flaky crust with an apple filling that is creamy, fresh and not too sweet. They are the perfect dessert for a festive fall occasion. Bake in the morning and refrigerate until dinner. Warm them just before serving and top with vanilla ice cream or fresh whipped cream. To make individual tarts, use 5-inch round pans. Note: Peeling, coring, and slicing of the apples can be done in about 5 minutes using a peeler/corer/slicer that clamps to a table. Preheat oven to 300°F degrees on the bake setting. Remove the puff pastry package from the freezer. Open and set each folded sheet on a platter or cutting board to thaw while you prepare the apples. Peel, core, and slice the apples. Sprinkle with lemon juice and cover tightly, so that they do not turn brown. Carefully unfold the thawed puff pastry onto a cutting board. Using the individual tart pans as guides, cut circles in the pastry. Place the pastry circles in the bottom of each tart pan. There should be enough pastry left to cut narrow strips to line the sides of the tart pans. Press the pastry into the sides of pans. Prick pastry with a fork. If you have used an apple peeler/corer/slicer your apples will be sliced in a spiral—cut the apple spirals in half. Place apple slices in a circle on each tart pan. Sprinkle 1 tablespoon of sugar over the top of each tart. Sprinkle cinnamon over apples if desired. Place tart pans on a cookie sheet and place in oven on middle rack for about 10 minutes, or until apples brown a bit. Remove from oven and place on the counter. Turn up the oven temperature to 350°F. Beat the egg in a medium mixing bowl, then add the heavy cream and 4 tablespoons of sugar. Beat until thoroughly mixed. 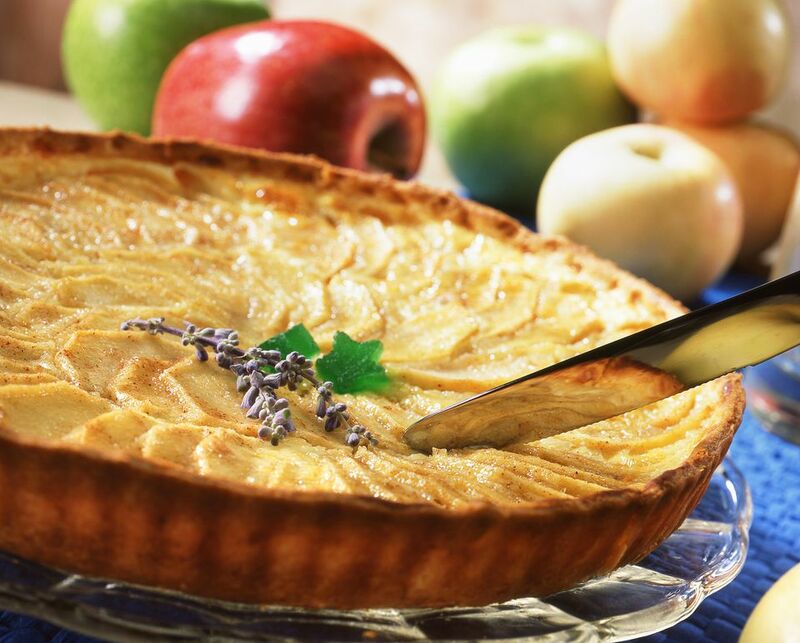 Pour the cream and egg mixture into each tart pan, covering the apple. Return tarts to oven and bake for approximately 45 minutes. The tart is done if a knife is inserted into the tart and it comes out clean.